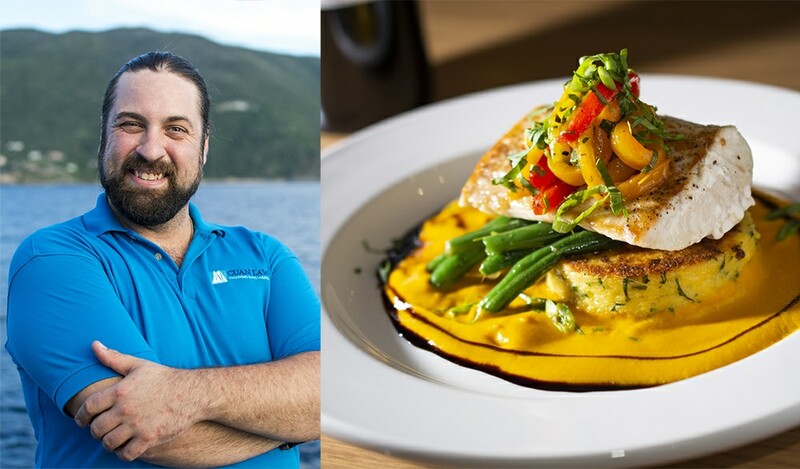 Not your typical liveaboard meals, prepare to be wowed by Chef Patrick! The All Star Liveaboard team is delighted to welcome Cuan Law’s new chef Patrick Wilson to the team! We had the opportunity to sit down with Patrick recently to get acquainted. Here are some of the highlights. Well, I went to culinary school back in Chicago in 2003 so I’ve spent the last 15 years of my professional career gaining knowledge and experience preparing a variety of cuisines and wonderful meals. I have traveled all over the world and have eaten at some of the best restaurants on the planet. I’ve been fortunate enough to work at some very reputable fine dining establishments and collected knowledge from many well-known and respected chefs. And what brought you to be our new chef? Back in culinary school I very distinctly remember setting a goal that someday I was to be the chef on a large ship in the Caribbean. And while Cuan Law is not “large”, I am extremely excited to bring my culinary talent to the guests and look forward to providing a level of cuisine only found on luxury liveaboard charters. What is your favorite thing so far about working on a boat? I love the water! I want to be on the water. I want to be in the water. Food and water are the essentials of life. I have a profound respect for both. SCUBA is my favorite in-water activity. I love that I am going to be able to enjoy diving with the guests a few times a week! If you had to choose a song that mirrors your cooking style what would it be? Love & Happiness by Al Green. When you love the food you create and love what you do, I believe the food tastes better. Happiness is a very important aspect of life. If you aren’t happy, you must work towards finding it because life is too short to not have love & happiness. I feel fortunate to have both. Tell us one of your favorite ingredients and how you will use those for our guests? Chili peppers! With a passion! Specifically the West Indian habanero pepper. I realize that not everybody is crazy about spicy food. I myself love it, but when it comes to cooking for the general public I have a way of incorporating such a small amount of heat that it’s almost completely undetectable. I dislike bland food. Food, like wine should have layers. When I cook, be prepared to taste at least three or four layers of flavor. Each layer is balanced in a way where none is overpowering, but rather can be tasted and enjoyed individually. fish sauce, gochujang paste, garlic, ginger, all curries and bacon – because – BACON! We have seen you scuba diving between meals, which dive is your favorite so far? Wow. That’s a tough one. There are so many great dives in the BVI. I would say the dive I like the most is the one I haven’t done yet. Ha, but for real, the wreck of the Rhone is really cool! If you had just one cocktail to share with a guest which would it be? I’m going to be boring with this one. I love a vodka soda with two limes. It’s clean, it’s refreshing and it’s water! I’d be happy to make a painkiller for a guest though. They are the perfect island cocktail, but too much sugar for me.